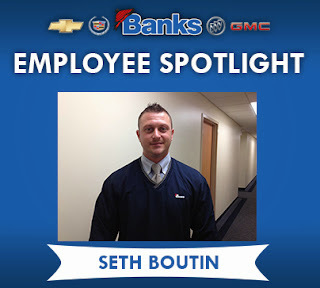 Seth Boutin is a Sales Consultant here at Banks and we're extremely fortunate to have him part of our sales team! 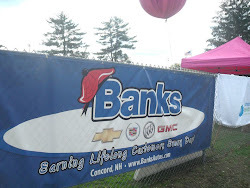 How long have you been with Banks? Exactly one year last month. What do you like most about working with Banks? I like the family atmosphere. It’s not corporate. They take care of their people on an individual basis. I also like the clean atmosphere and the cleanliness of the facility. Mostly, I like the customer base and the down to earth, laid back vibe. What’s your favorite memory about Banks? I love the last Friday of every month because of the barbecue. I also love the Yankee swap at Christmas time. The camaraderie is awesome. If you were a professional wrestler, what would be your theme music? Welcome to the Jungle! What one food do you wish had zero calories? Kraft Mac and Cheese, that is my favorite meal, I just can’t stop. Favorite childhood memory: I’d have to say spending time at the lake at the cabins up in the North Country. What are your hobbies? I love to go to the gym, I love to draw, travel and ride my motorcycle. What TV show or movie are you most ashamed to say you love? Pretty Woman – I end up watching it whenever it’s on TNT or TBS. I just can’t help it. If you could have any super power what would it be? Immortality!